OSE 8mm Gold Plated Bullet connector with housing are a perfect match for the high current brushless power systems. 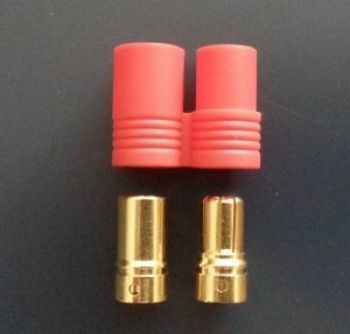 What makes the OSE gold bullet connectors different than the lesser expensive connectors seen on the market? We have our bullet connectors plated with a heavy gold coating. Twice the thickness of most of the other connectors being sold elsewhere. This increases the cost BUT makes the gold finish last longer. Allowing your system to run at a higher efficiency. Order 5 pairs and Price drops to $1.90 each. Order 10 pairs and Price drops to $1.60 each. (1) Male, (1) Female & (1) nylon housing. 5/8 wide, black and red shrink wrap.